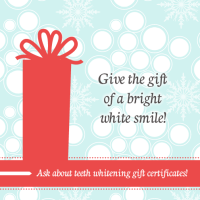 We all want a bright, sparkling smile for winter festivities! However, if your teeth are less than lustrous, you might consider teeth whitening to get your smile photo ready. First things first: Talk to Dr. Co before whitening. Before you decide to whiten, it’s a good idea to visit Shoreline Dental for a thorough cleaning and exam. It’s a good idea to treat any existing problems with your teeth and gums before you whiten, such as cavities. You’ll want to be sure there are no unseen dental problems needing treatment. Additionally, Dr. Co can help you choose the best whitening solution for your specific goals and desires. The active whitening ingredient in most whitening treatments is usually hydrogen peroxide, which, according to many studies, is considered to be safe. When used as directed, at-home whitening treatments are considered to be safe. However, since they’re not custom-fit to your smile, they could irritate your gums or cause tooth sensitivity. Professional bleaching solutions are stronger than over-the-counter options, meaning you can achieve a whiter, more stunning smile in less time. Nursing or pregnant women and individuals with untreated tooth decay or gum problems should not use whitening products. Talk to your dentist in Shoreline to learn which teeth whitening option is right for your smile. Book your next cleaning appointment by dialing 206.440.0065 and take the first step toward your sparkling, camera-ready smile!